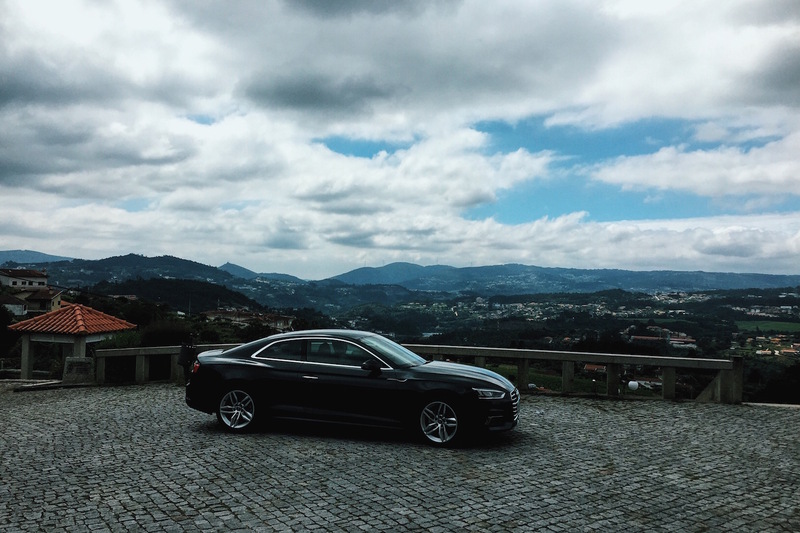 As you may have seen on my Snapchat and Instagram, a week ago Audi invited the missus and me to Porto to take the new Audi A5 and S5 Coupé for a spin through the picturesque countryside of northern Portugal. 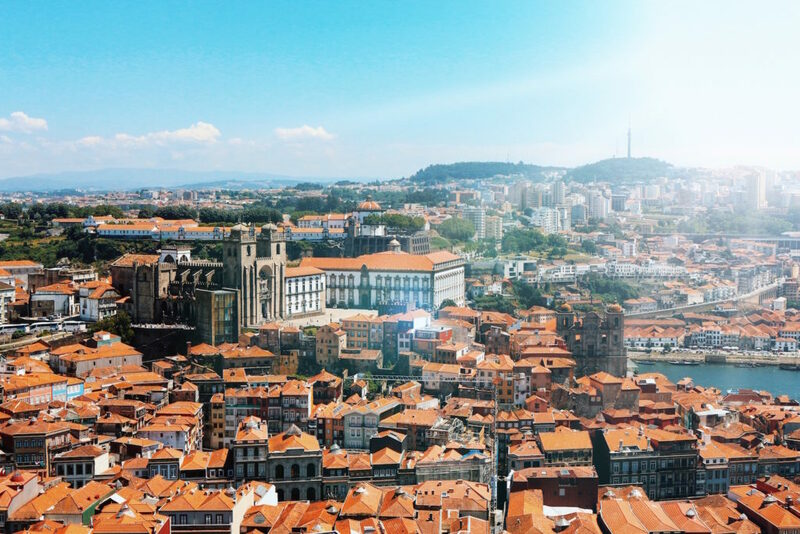 You can imagine, that when Audi knocks on your door, you don’t think twice and since we had already heard so much good things about Porto anyways we decided to extend our stay for two more days so we also have some time to explore the city. But first things first. 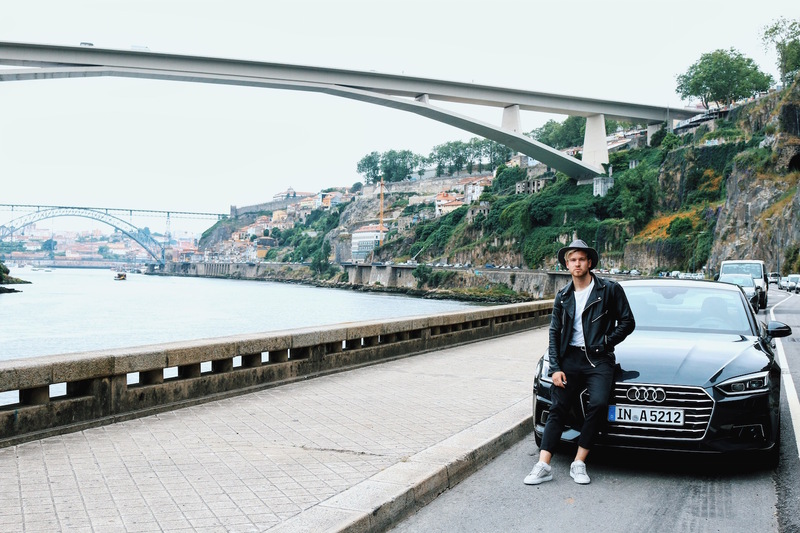 Once we had familiarized ourselves with our car for the day, a brand new Daytona grey Audi A5 Coupé, we started our road trip in the historic city center of Porto, where we could literally feel the looks from people on the street turning their heads after our car, which made cruising around even more fun. Subsequently we followed the river Douro towards the outskirts of town. Once we had left the city, we went on southeast along the river and through incredibly beautiful landscapes with breath taking views over the region, thrilling serpentines which gave us the opportunity to test the impressive roadholding of our A5 and dozy little villages on the countryside. Every now and then we stopped to take a deep breath and grasp the beauty of this place. 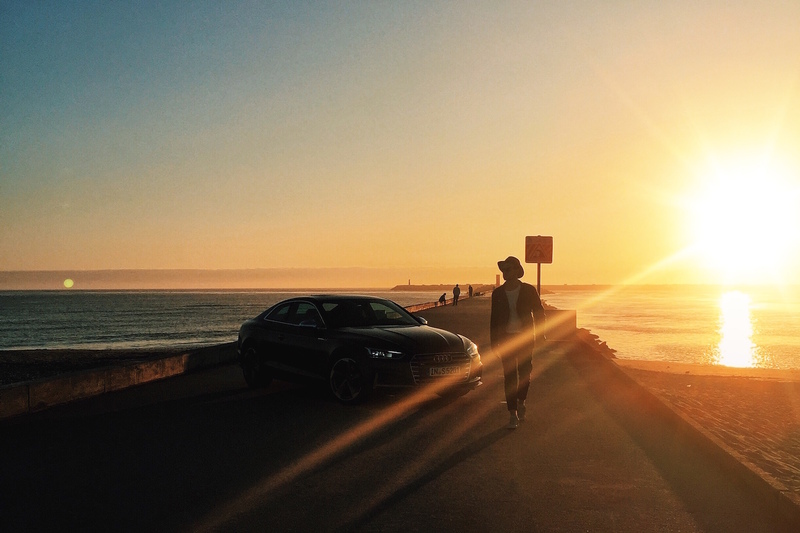 Our route finally led us down to Arouca and from there we headed west towards the Atlantic Ocean coast where we arrived just in time for golden hour and to take some epic snaps at the beach in Aveiro. 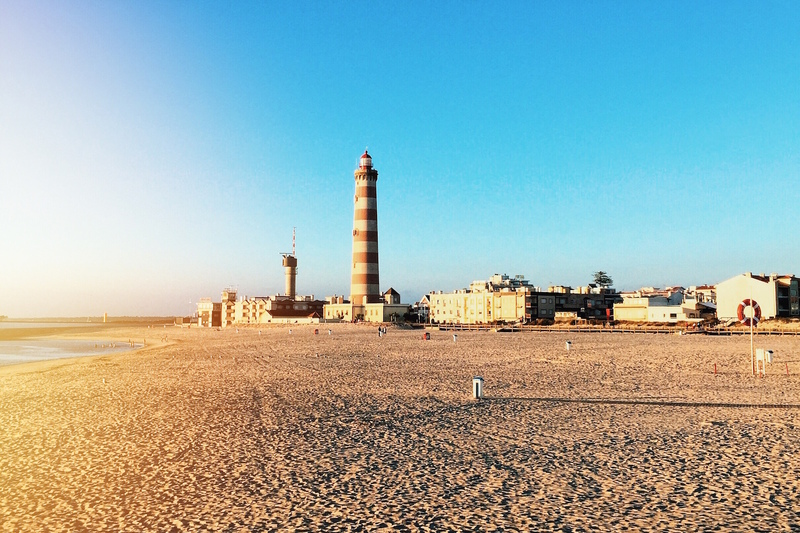 If you have time for a road trip when in the region, you really have to go down to Aveiro. 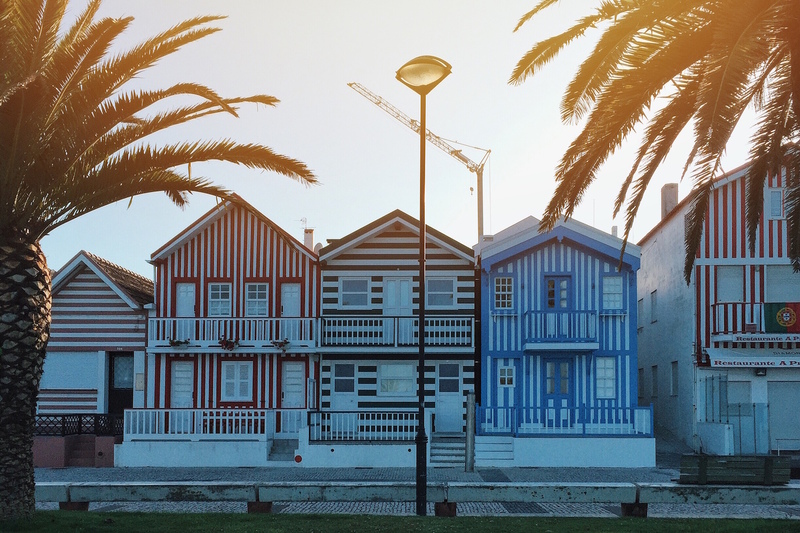 From the cool colorful houses at Costa Nova do Prado, to the cozy little city beach Praia Velha and the picturesque lighthouse Farol de Barra, this little town has just much to offer. There’s literally one photo location following the other, and the best thing is, they are all easy accessible. 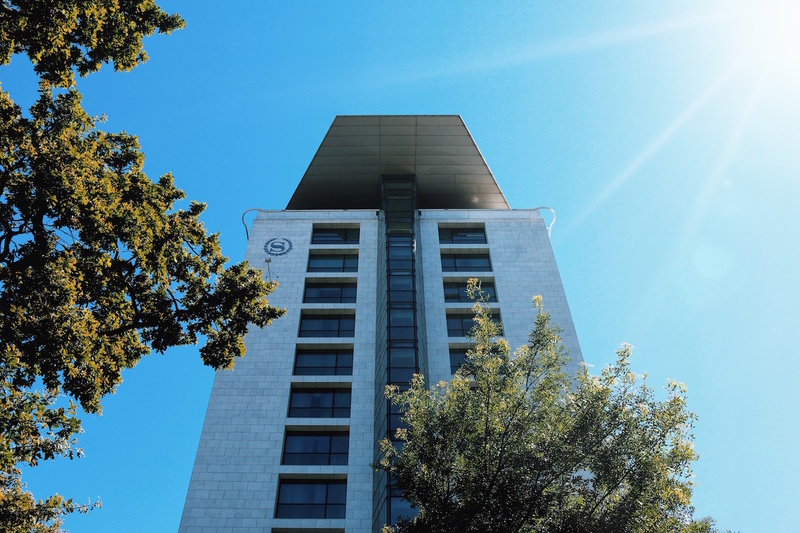 Once we had returned to Porto we checked in at the luxurious Sheraton Porto, our home for the next three days. To our surprise, we got upgraded into a spacious executive suite with a bed that felt like heaven. 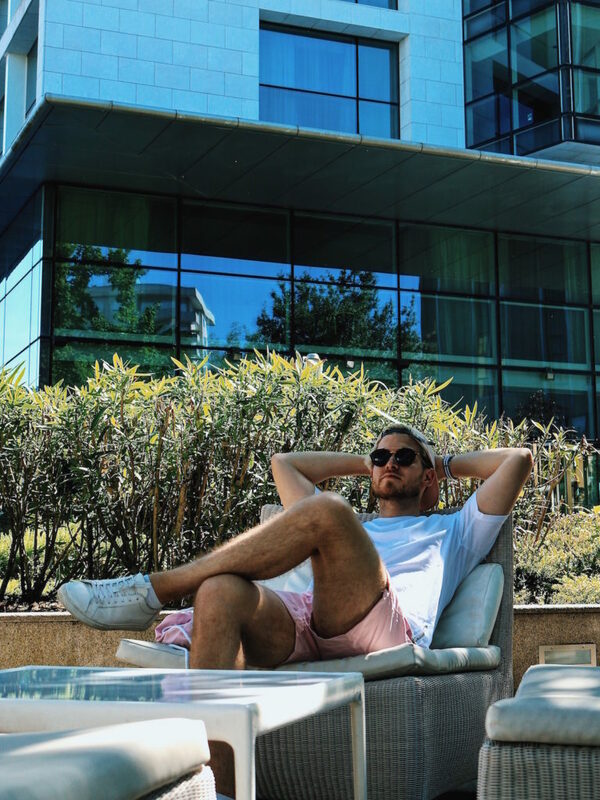 We chose the Sheraton Porto, because after traveling on low budget in the past, we felt it was time to spoil ourselves with a little comfort so we can fully relax and enjoy our time in the city. 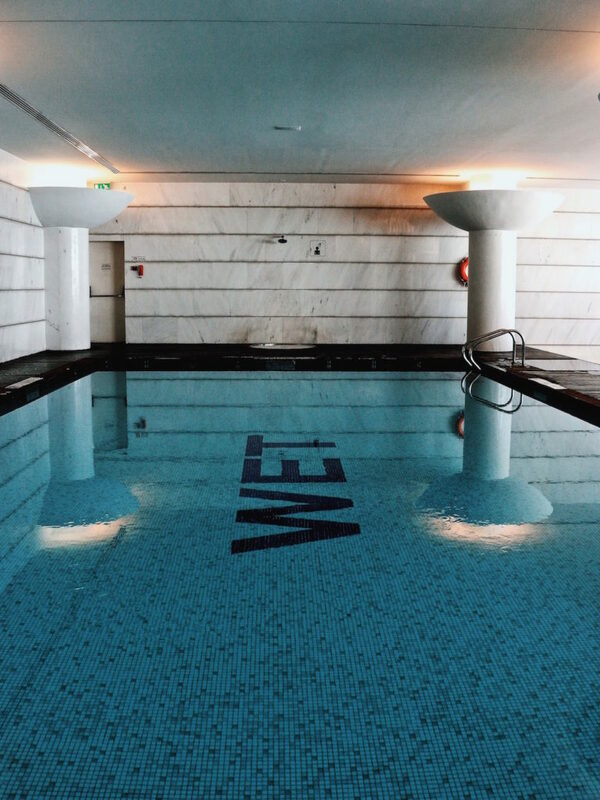 The hotel immediately appealed to us with its luxurious facilities including a spa area, a gym, a quiet garden with a pretty terrace as well as a top-notch restaurant and most importantly its superior rooms. I think an awesome vacation starts with finding a great accommodation, and this time we really made a perfect choice. On our first day in the city we went an exploration walk covering most of the major sights of the city. 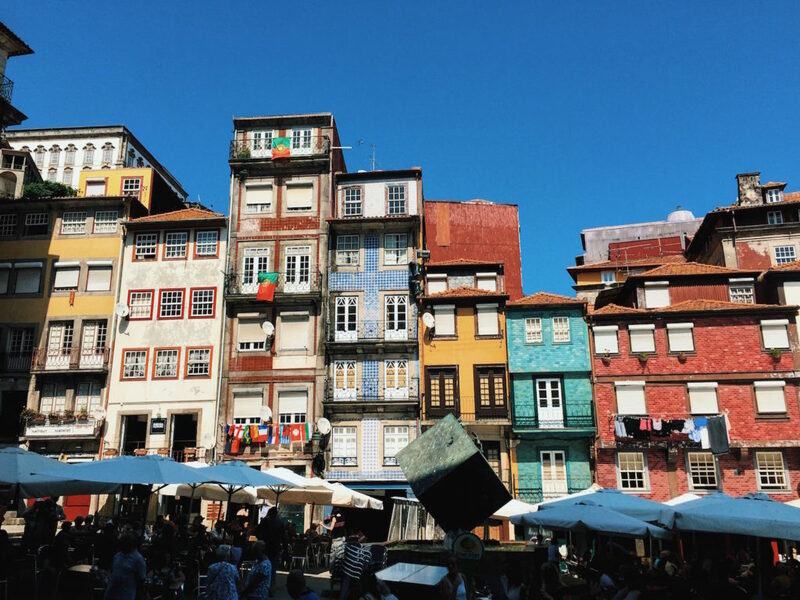 The old town of Porto is listed as UNESCO world heritage, and as it turned out for a good reason. Portos old town offers a unique mix out of monumental ancient architecture and refreshingly colorful traditional house facades made of little patterned tiles. 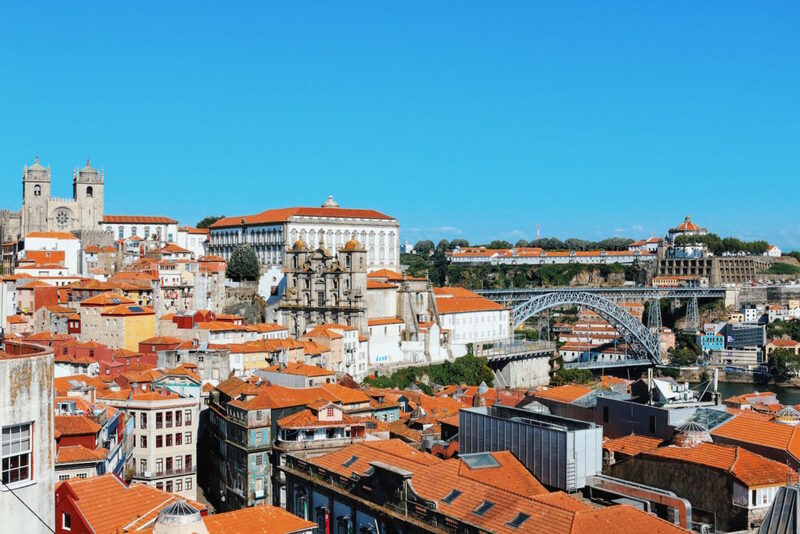 Right through it runs the river Douro with vibrant gastronomy and bars alongside both riverbanks. 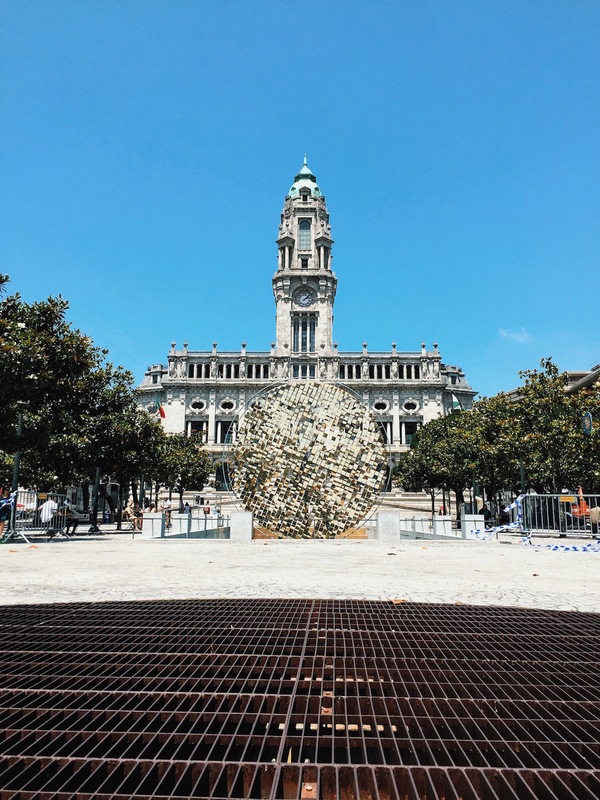 We started our tour in front of the city hall at Praca de Liberdade, a central square next to the Sao Bento Metro Station. From there we walked down towards the riverside. On our way we passed the magnificent Palacio da Bolsa and the ancient church Igreja da San Francisco. 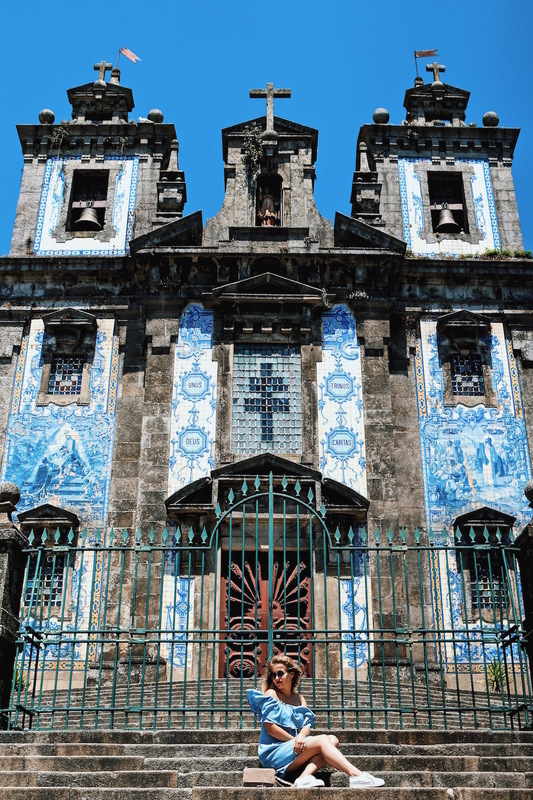 Once we had reached Ribeira the city’s famous riverbank we had to take a minute to realize the beauty of the city. From there we had a perfect view at one of the city’s landmarks, the Luis I Bridge. 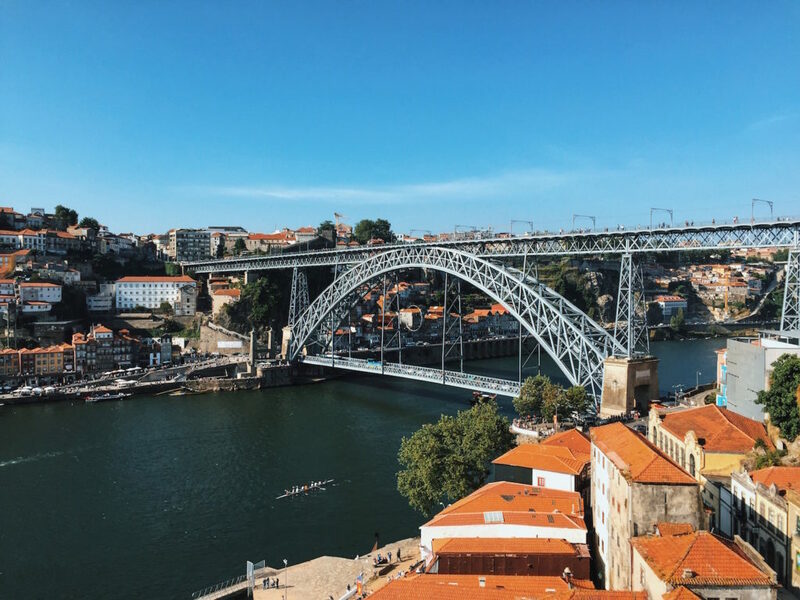 After we passed Praca Ribeira, we decided to head uphill again, because we just wanted to walk across the famous Luis I Bridge. 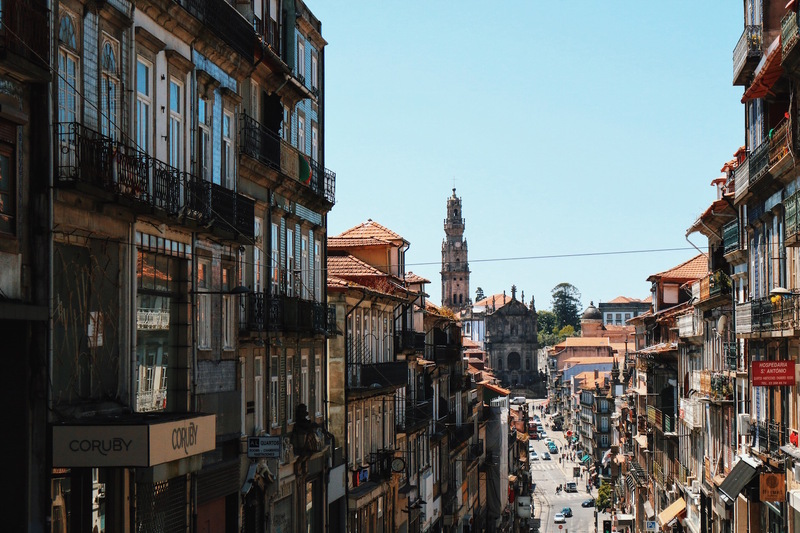 Following some of the charming small alleys we finally found a stairway that turned out to lead us right up to the Sé cathedral throning majestically on a hill over Porto. 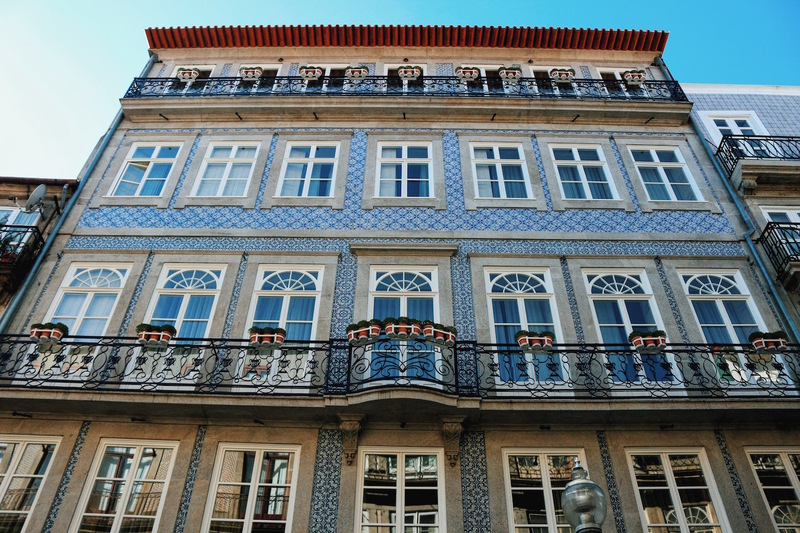 The pompous Palacio da Bolsa looks as majestic on the inside as it does from the outside. 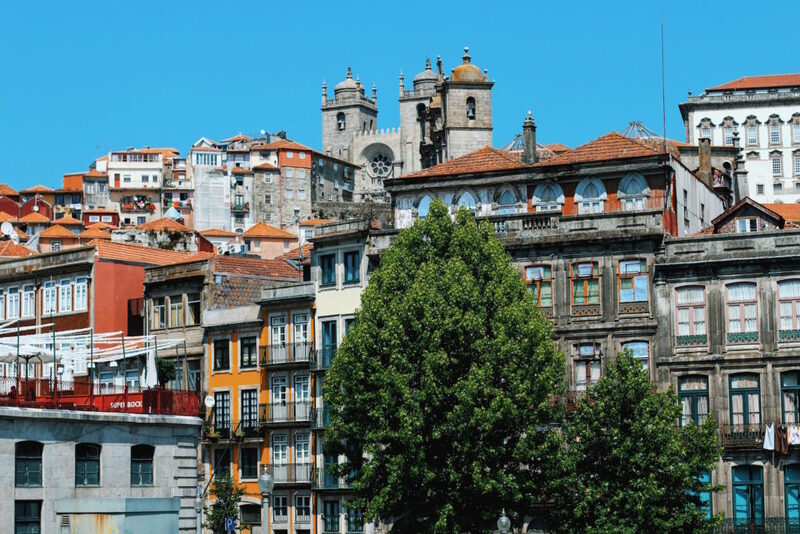 The typical mix of architecture in Porto’s old town. 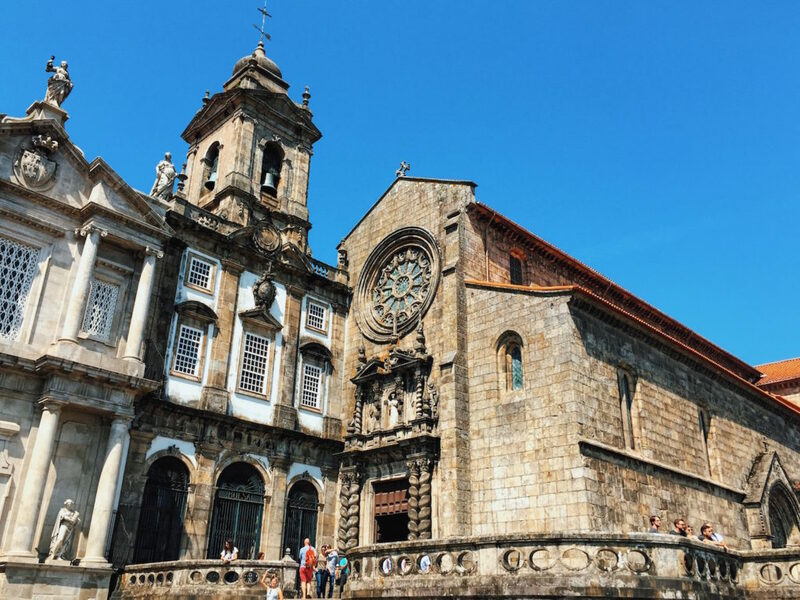 From the Sé Cathedral, which is one of Porto’s oldest and most important Romanesque monuments, it wasn’t far to the Luis I bridge anymore and so we rewarded ourselves with some ice-cream for the endeavours of climbing about 500 stairs. 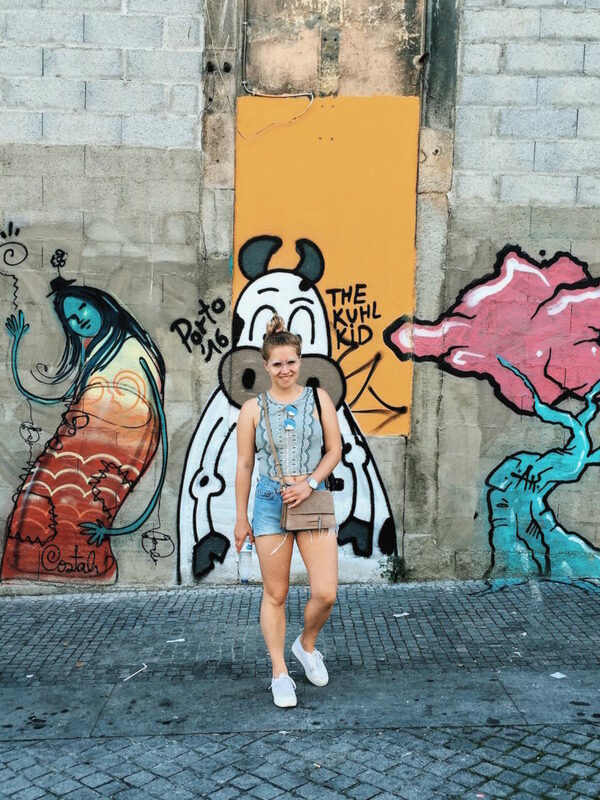 After having recharged our energy tanks and cooled down a little bit, we even discovered some pretty awesome street art. I admit getting up to the Luis I bridge by foot is a bit of a struggle but it’s worth the pain. 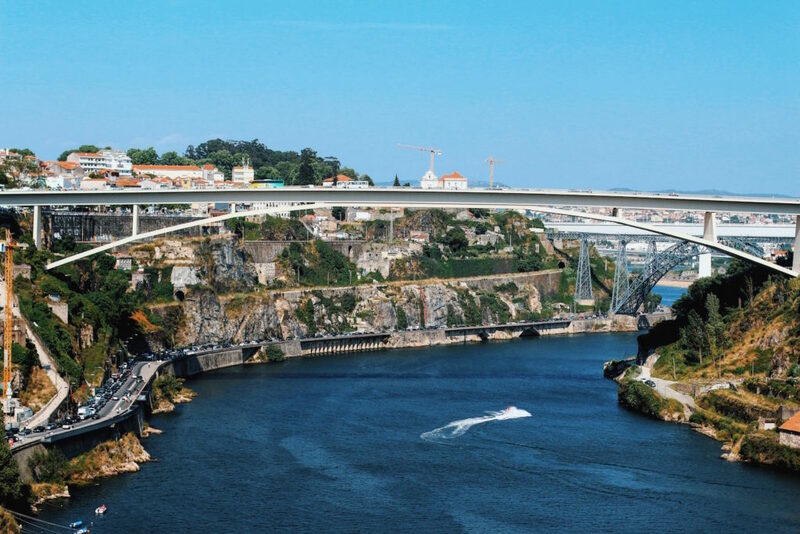 From up on the bridge you have a spectacular view over Cais Ribeira and the river Douro. And as the sun started to set we finally found the time to take our first vacation couple selfie. Not bad, what do you think? However, the bridge walk is definitely a must-do when in Porto. Also, at the other side of the bridge there’s a cable car which takes you right down to the riverbank again. Although the ride was quite short, it offered yet another cool perspective at the old town, the Ribeira, the river and of course the Bridge. Slightly exhausted from all the walking we finally concluded our day with an exquisite dinner at Cantinho do Avillez, a welcoming and relaxed eatery located right in the heart of Oporto at Rua Mouzinho da Silveira, that made Portuguese inspired quality food its number one priority. Although there’s no outside seating area, I highly recommend Cantinho do Avillez since it delighted us with its authentic Portuguese ambience and fantastic culinary creations. My tipp is sharing the plates, so you get to try out different dishes. As a starter we had deep fried green beans with tartar sauce, followed by the famous Portobello mushrooms risotto with parmesan and basil and a super tender braised tuna with sautéed vegetables. For dessert we enjoyed the airy raspberry cheesecake with basil in a jar. Also, when in Porto you have to try the famous wine from the surrounding regions. As I was told the best ones come from Dao as well as Douro region. All in all a pretty perfect day. We started the next day where we ended the last: in Foodie-Paradise. 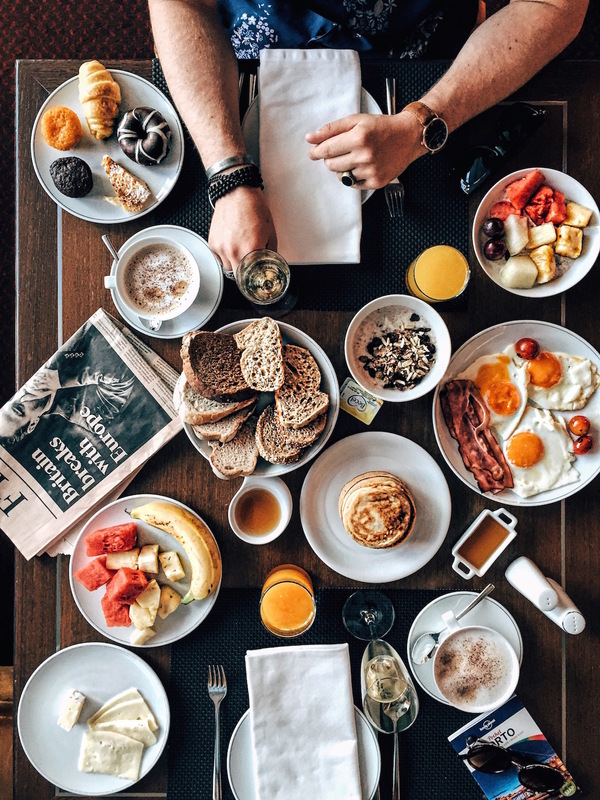 We had already heard about the amazing breakfast at Porto Novo restaurant at Sheraton Porto and indeed this breakfast buffet really left none of our wishes unfulfilled. 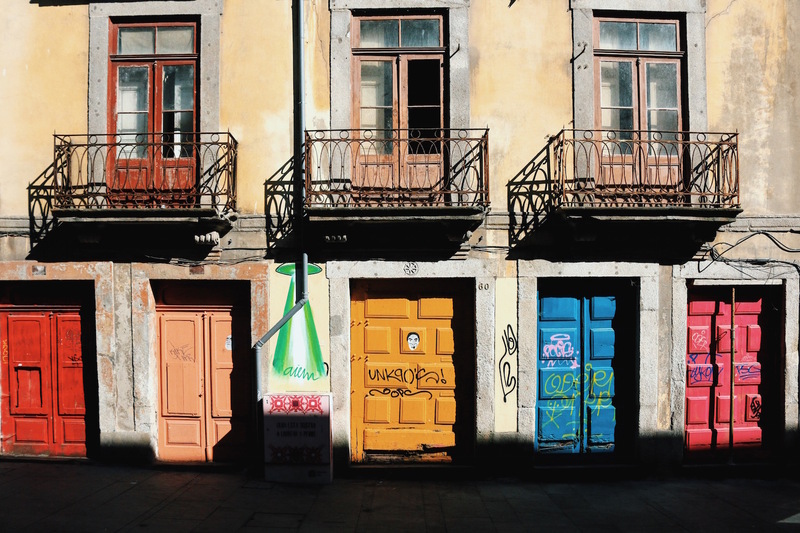 Our second sightseeing tour started at one of Porto’s most famous old town shopping streets, Rua de Santa Catarina. 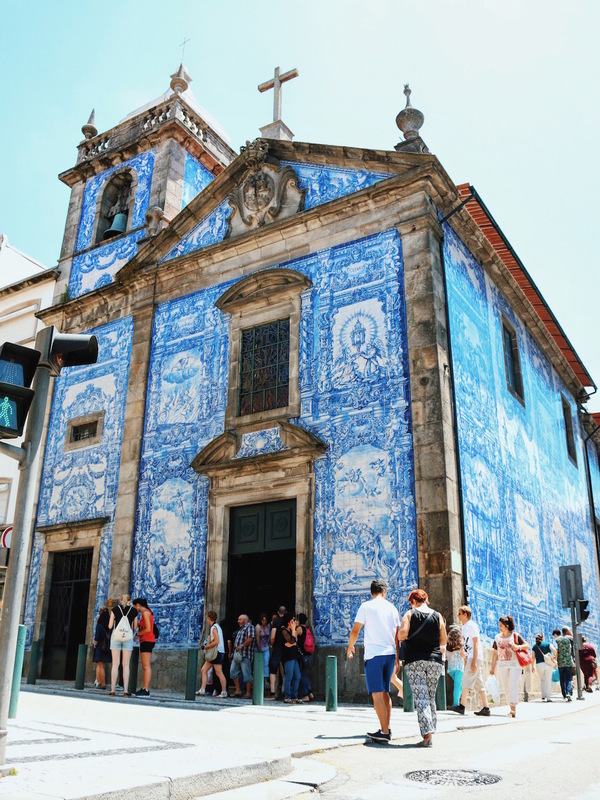 There we also visited the beautifully ornamented Igreja de Santa Catarina with its stunning Azulejo Facade. 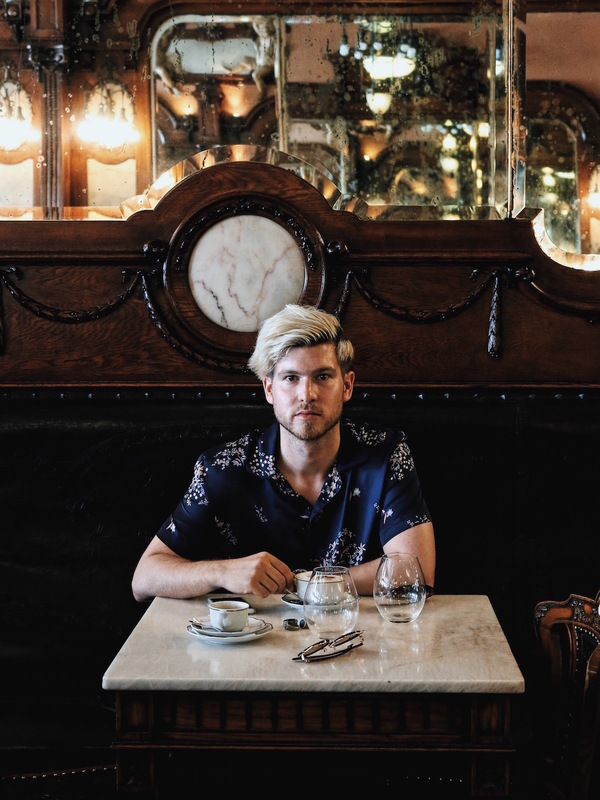 Also on Rua de Santa Catarina you find Cafe Majestic, a literally majestic classic coffee house, which is als famous for being the place where Joanne K. Rowling came up with the idea for Harry Potter. Although Cafe Majestic is chronically crowded with tourists, overpriced and also the food in my opinion is not really earth-shaking, its atmosphere and overblown interior design make it worth a quick visit. 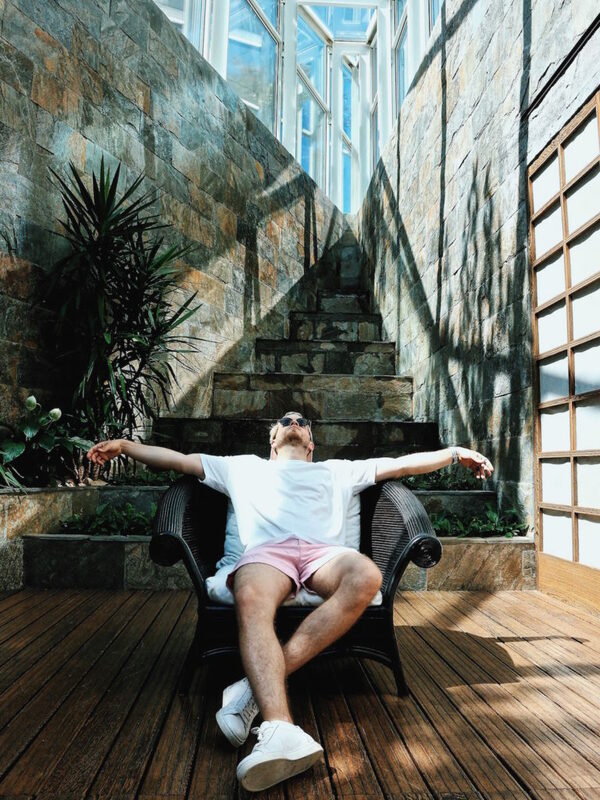 Drop by Cafe Majestic for a quick coffee and get inspired by its literally majestic interior. My gorgeous missus in front of yet another richly ornamented church: Igreja de Ildefonso. Our next point of business was the Torre dos Clerigos which we had already seen triumphantly overlooking the city the day before. The only thing separating us from the apparently incredible view on top of that church tower were the roughly 250 ridiculously narrow and steep stairs leading up there. 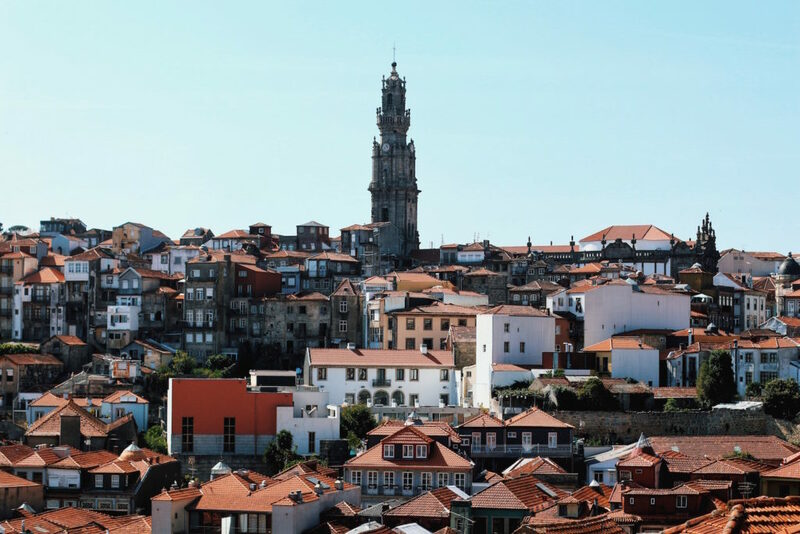 Once again, the view over the sea of red tile roofs of Porto’s old town compensated us for our efforts. The second half of the day, we decided to take things a little more easy and explore Portos “hipper” neighborhoods located in the western area of the old town. 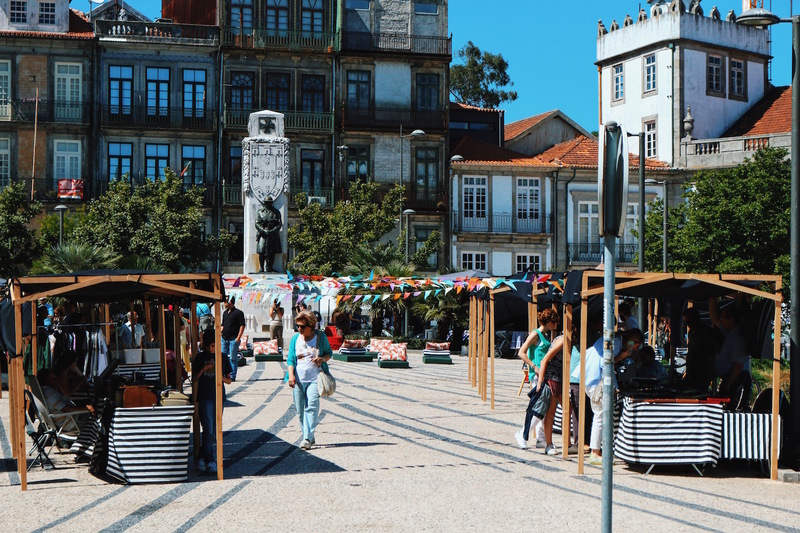 An absolute highlight of visiting Porto on a weekend are the numerous weekend markets, where you could find the one or other forgotten treasure among heaps of vintage decoration, traditional azulejo tiles and all kinds of accessories crafted in Portugal (particularly sunglasses and cork bags and belts). And even if you’re not in a shopping mood, just get yourself an ice cream or cool drink and enjoy the scenery listening to the several street musicians. 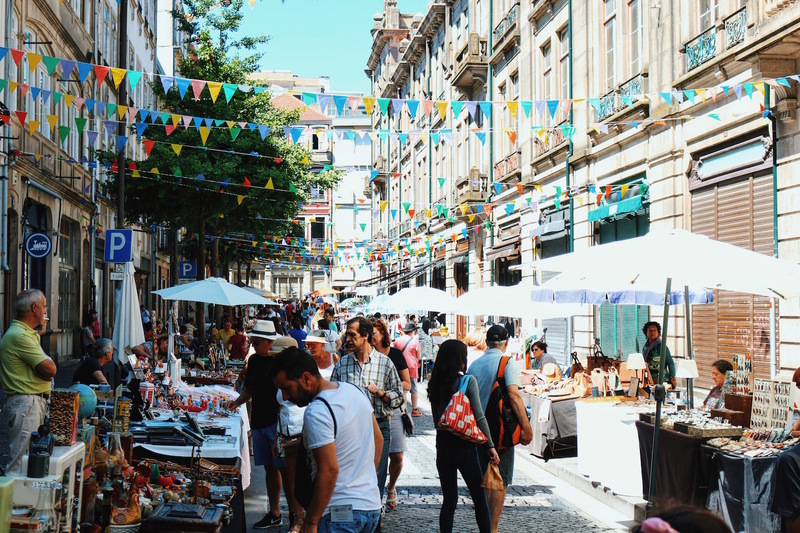 Wether located in side alleys or quiet little squares you just have to love Porto’s markets for their laid-back and relaxed vibe. 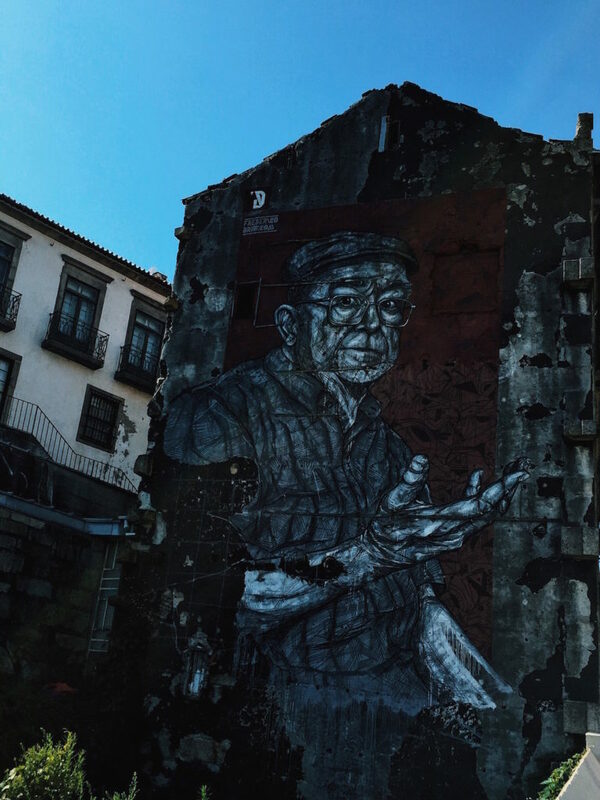 For all the artlovers among you I can also recommend a stroll along Rua Miguel Bombarda with its many small art galleries. 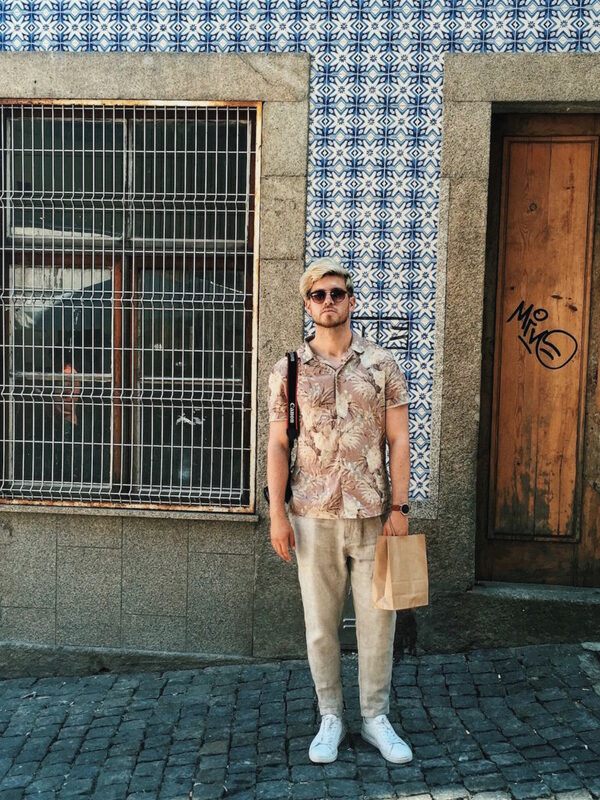 Also when in the area, make sure to drop by the CC Bombarda (Commercial Center Bombarda), which is a hip and unique little shopping mall with stores selling locally designed clothes, cosmetics, jewellery, food & teas as well as deco and even vinyls – definitely one of Porto’s hipster hotspots and an interesting concept space. For dinner that day, we wanted to try getting a table in one of the many restaurants located along the riverbank Ribeira. 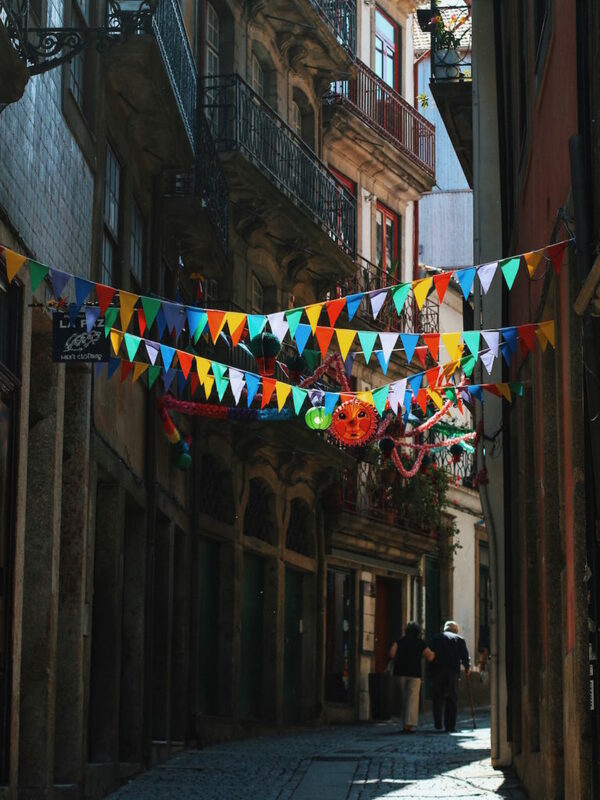 On our way down to the river we came across Rua das Flores, which is another one of Porto’s splendid old town streets. 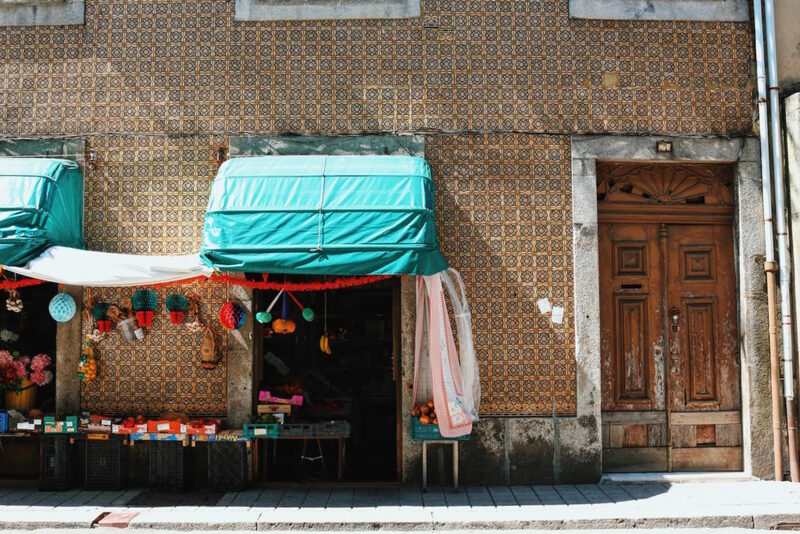 The many richly ornamented facades, the numerous little cafes & restaurants as well as several souvenir and delicacies shops make Rua das Flores another must-see in Porto. If you are into romantic dinners in the sunset with a sensational view and outstandingly delicious local food, we found exactly what you are looking for. 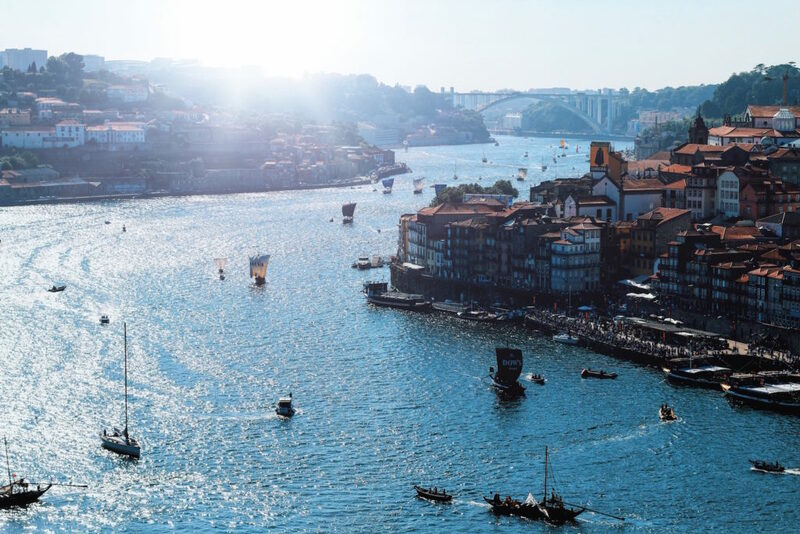 Bacalhau, our favorite restaurant in Porto, is located at Ribeira right at the bank of the river Douro, and offers its guests the ultimate dinner experience in Porto. 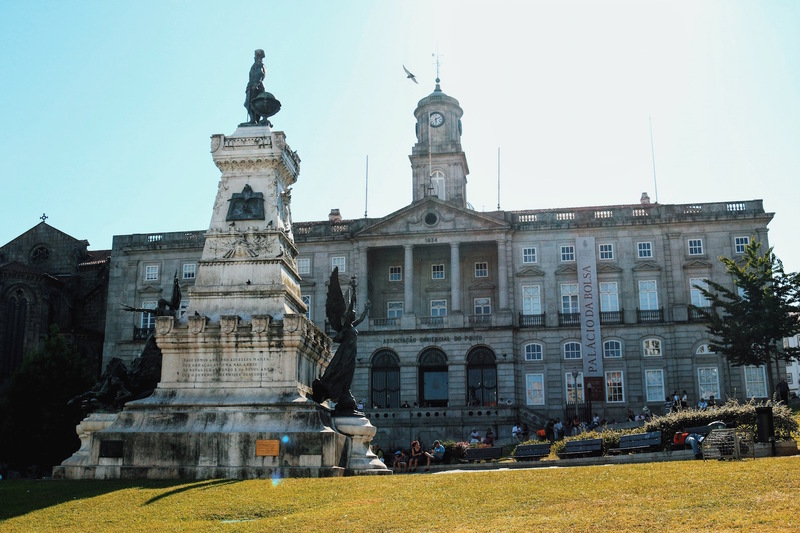 Located right at the end of Ribeira, Bacalhau is a little off the main tourist spots on Praca da Ribeira, which makes the place a lot quieter and thus more enjoyable. 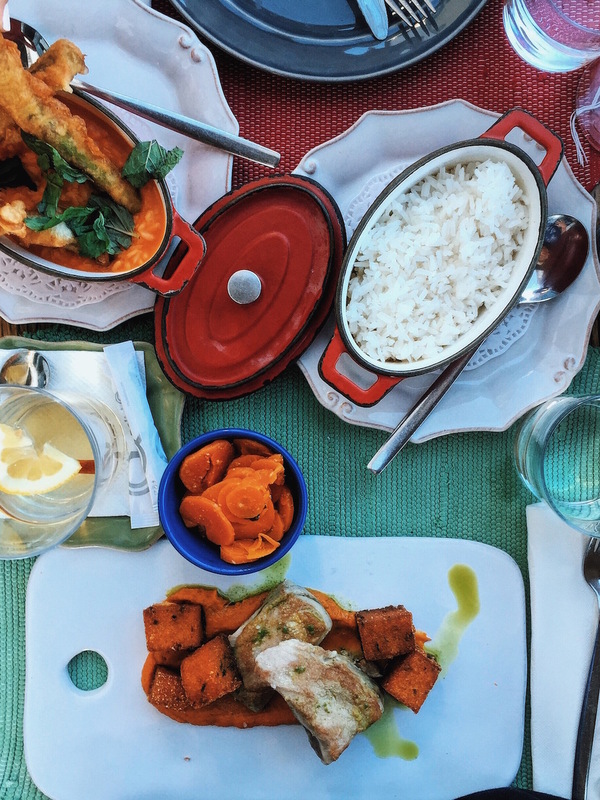 The restaurant focuses on traditional Portuguese cuisine and only sells Portuguese products. Bacalhau is quite small but since it does not take reservations you should always be able to get a table for two if you’re willing to accept a little bit of waiting time. Believe me, it’s absolutely worth the wait. I had deep fried asparagus in an interesting tomato sauce with beans and probably the best tuna steak ever, accompanied by a great glass of wine. 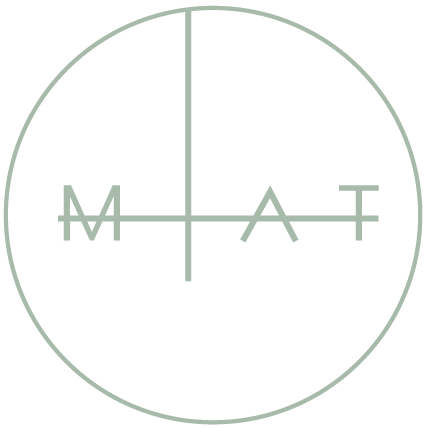 The food was simply excellent, and the atmosphere, so beautiful it was almost cheesy. As the sun set its warm light fell right onto the river and the the Luis I Bridge which we could see from our table, simply incredible. After the walking marathons of the previous days we decided to make our last day all about regeneration and deep relaxation. As much as I love traveling and exploring new places, somehow traveling is also always a bit exhausting. So we decided to not set an alarm for once and just sleep in. Then, after a late breakfast, we enjoyed a swim in the pool and relaxed a bit in the Spa area and the garden lounge of the Sheraton. With only a couple of hours left until our flight, we felt like we still want to see the ocean once more before we return to Austria. A friend had told us about rock pools located at the coast just outside of Porto, which was only a 10 min drive from our hotel. 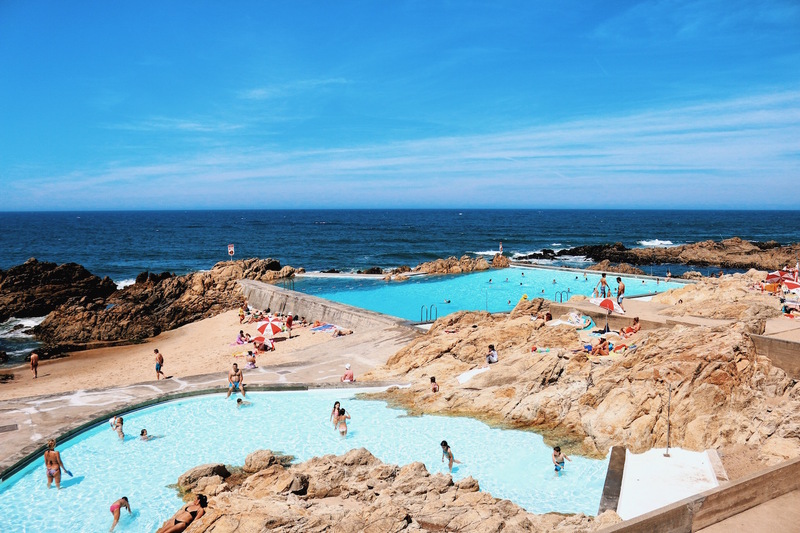 The Piscina das Mares is located in a Leca de Palmeira a small town at the Atlantic Ocean just outside of Porto. When we arrived there, I felt a bit thrown back to my time in Australia. 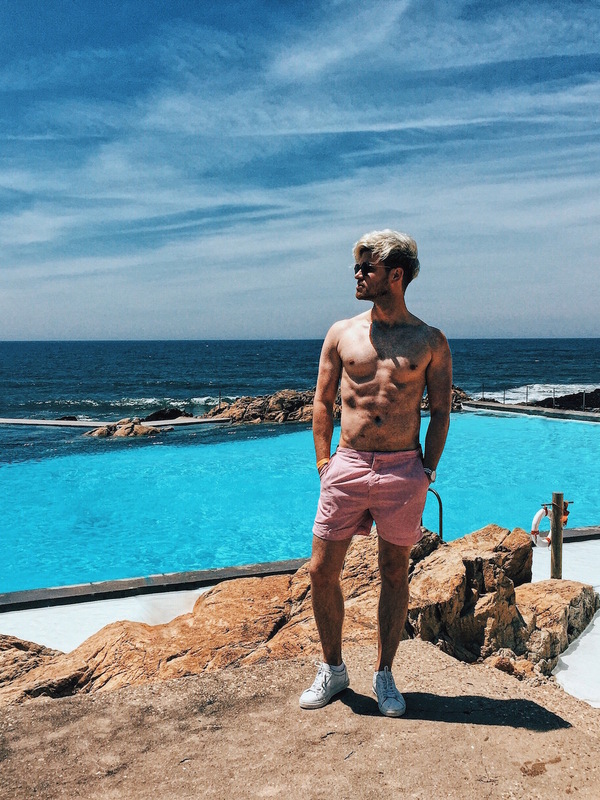 I admit the pools at das Mares are not as fancy as Icebergs in Bondi but the ocean view and the surrounding rocks, still made this place look pretty cool. While the missus mostly worked on her tan lying in the sun, I clenched my teeth and went for a quick swim with 17 degrees celsius, let’s say “refreshingly cool” water. Finally this excursion to the oceanside concluded an all in all perfect city trip, which had pretty much all in it we could wish for. 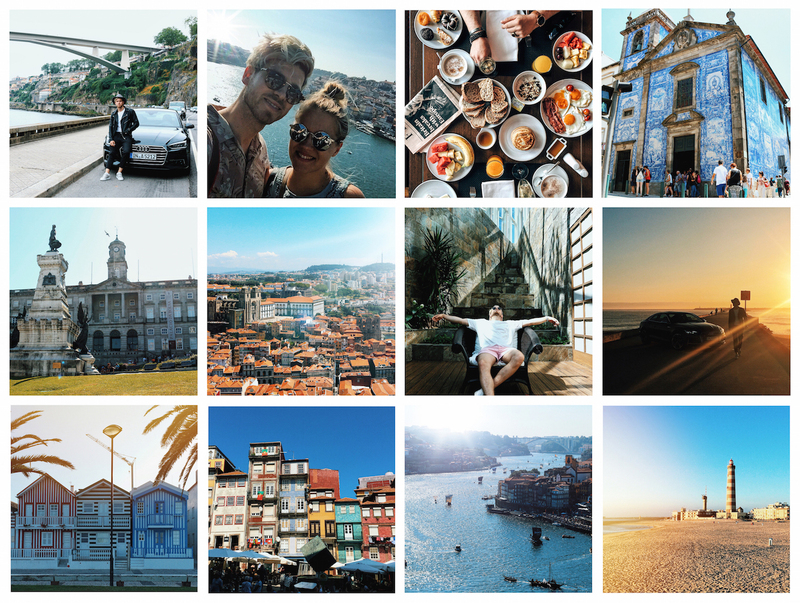 Porto absolutely fascinated us with its incredibly beautiful city and charming mix of old and new. I also particularly enjoyed how the city managed to integrate modern elements and creative forms of urban living while preserving the cities historical and ancient character. Porto’s proximity to the water further provides for a pleasant nautical flair. 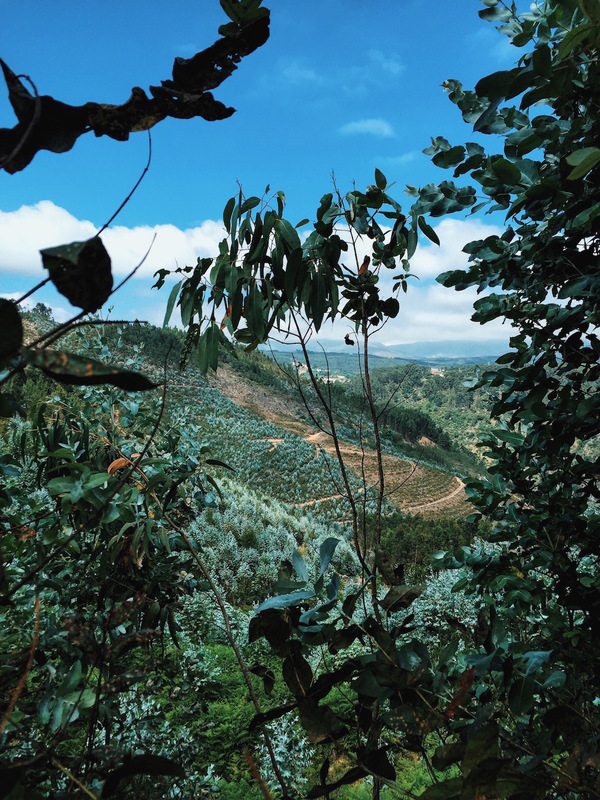 Its geographic location in one of Europes most beautiful regions offers many opportunities for day trips and its traditional link to good food and wine makes it a paradise for foodies. 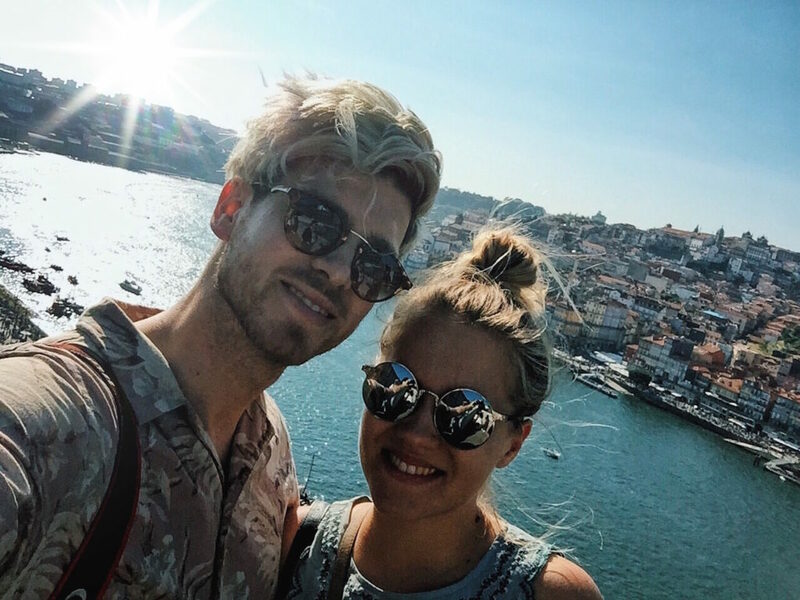 Ein klasse Bericht der sofort Lust auf einen Besuch von Porto macht. Schöne Häuser, schöne Plätze zum Verweilen und es scheint einfach alles zu passen. Der Tripp mit den Audis war bestimmt auch ein Erlebnis. Ihr habt aber auch immer wieder ein Dussel, das ihr zu solchen Exkussionen eingeladen werdet. Macht immer wieder Spaß dein alsauch Sophies Berichte zu lesen. Danke für die Anregungen und die Lust auf andere Städe entdecken zu wollen. 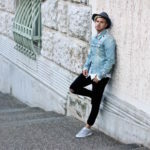 Traumhaft dein Blog 🙂 Habe sofort lust auf Urlaub. Deine Bilder sind wieder super. So ein toller Reisebericht und einfach hervorragende und absolut einladende Fotos. Hab beschlossen, da muss ich auch mal hin.